Over the past few weeks I've been taking you through each part of the wedding invitation, and chatting about some simple etiquette rules or guidelines, such as who to include on your invitation, how to write the bride and groom names, and going over the basic anatomy of an invitation. Today's topic is one where I see the most number of errors, and where couples tend to get a little confused. While it may be more along the line of grammar than etiquette, it's still VERY important to get this stuff right. 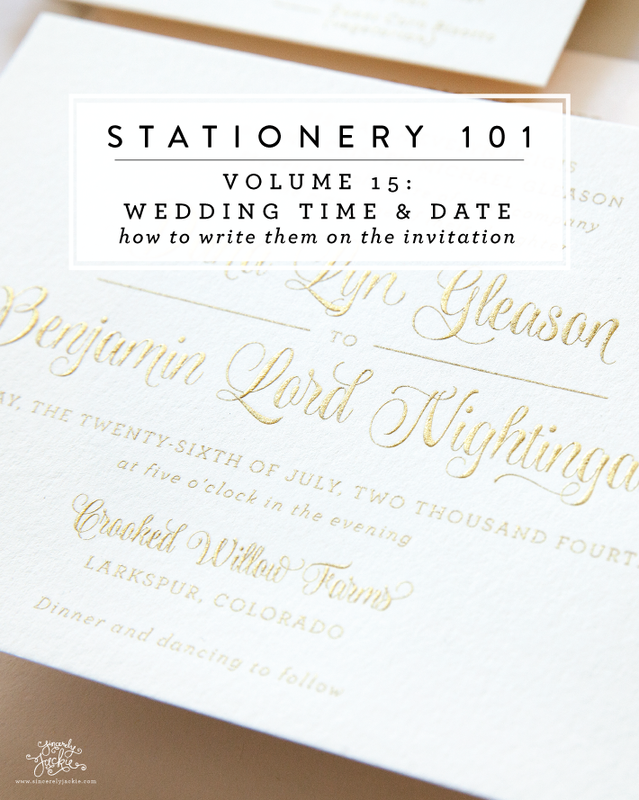 Today we are talking about how to write the wedding date, time, and year on your invitation. Always spell out the numbers; such as "four" instead of "4". It's always "half after four" and never "four thirty". Include "o'clock" when writing the time. For example, it would be "half after four o'clock", or "four o'clock". Note, I think it's OK sometimes to drop the "o'clock" for half hours. It's always "half after" and never "half past". It's "morning" up until 12noon, "afternoon" from 12noon-5pm, and "evening" any time from five and afterwards. Some people say that 6pm is when "evening" starts, but I personally tend to go with 5. You could really do either, though. The proper way to write it would be "eleven o'clock in the morning", "half after four o'clock in the afternoon", and "seven o'clock in the evening". Since you write out the numbers, and include "morning, afternoon, or evening", you never include "am" or "pm". Always write out the day of the week, number of the month, and full month. For example "Saturday, the tenth of May". Compound numbers, such as May 28th, have a hyphen and are written as "Saturday, the TWENTY-EIGHTH of May"
While it's a little less traditional, you can write "Saturday, May twenty-eighth". The number of the month does not get capitalizes, but the day of the week and the month itself does. Always write out the number of the year, such as "two thousand sixteen." There is no "and" in the year. Never write it as "two thousand and sixteen". Nothing in the year needs to be capitalized. These are the general rules I follow and advise my couples on. Of course, you can go against tradition, while still having beautifully elegant invitations, but be sure to chat with your stationer along the way to ensure the best possible result! Do you have any other tips for writing out the time, date, and year for invitations?